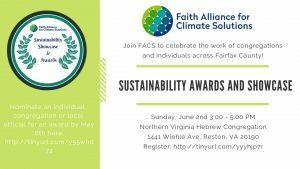 Faith Alliance for Climate Solutions (FACS) is proud to announce our Showcase and Awards Celebration on Sunday, June 2nd from 3:00-5:00 PM at Northern Virginia Hebrew Congregation. The event will begin at 3:00 PM with a Showcase “Expo” featuring local organizations’ sustainability initiatives. To reserve a table, please email jackie@faithforclimate.org. At 3:30 PM we will hear from our keynote speakers and present awards to our sustainability champion award recipients. From 4:30 – 5:00 PM, the event will end with additional time to explore the local organizations at the showcase. The Sustainability Champions Awards celebrate and recognize the contributions of individuals, congregations, businesses and local elected officials/public sector employees in Northern Virginia. These individuals and organizations work tirelessly toward improving the environment; contributing to a healthy, livable climate, in our community. Nominations will be accepted in these four categories: individual, congregation, local business, and local elected official/public sector employees. Please take the time to nominate those who deserve to be celebrated by submitting a nomination form before the May 6th deadline. Awards will be presented during the June 2nd, 2019 FACS Awards and Showcase Event at 3:00 PM. Detailed information about how to nominate can be found here. All are welcome to this event! Please email jackie@faithforclimate.org with any questions.